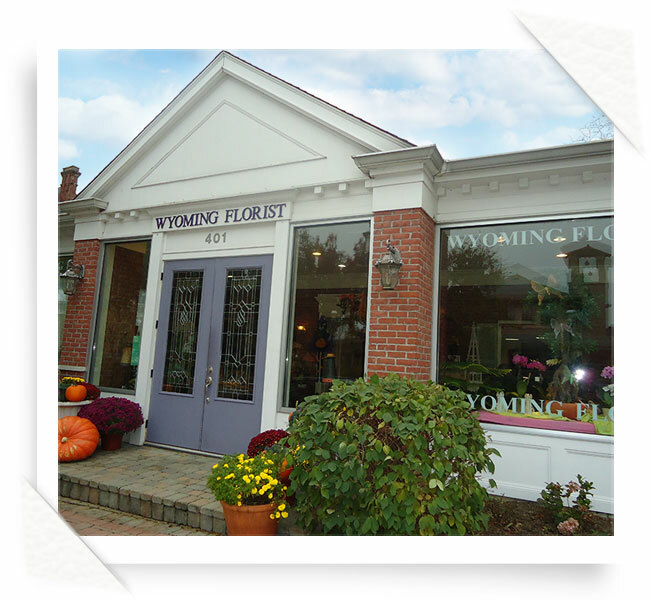 We would like to welcome you to Wyoming Florist, where "delivering smiles" is our mission. We are dedicated to giving exceptional service and using the finest quality floral products in our creative designs. We specialize in your every need - Births, Birthdays, Anniversaries, Funerals, etc.. We will help you express your feelings in just the right way, even if "just because" is the perfect sentiment for the day. If it's a party or wedding you are planning, we can help you create just the right look and feel for your event or help make your dreams come true on your special wedding day. If you have any questions or are in need of more information, please call us directly at 1-513-821-3931. We are here to serve your needs and to make you and the recipient "smile"! 9:00 a.m. to 2:00 p.m. Saturday. We deliver to the greater Cincinnati Area including Northern Kentucky, Fairfield, West Chester and Hamilton. A local delivery charge of $11.00 will be added to each order for each address and we can accept orders for same day delivery until noon. Orders for zip code 45215 will be charged for $7.50 and orders can be accepted until 3PM for same day delivery. We offer worldwide delivery service: U.S. orders must be received by 12PM in the time zone of the recipient to assure same day delivery. Orders received after that time will be delivered the following day. A $5.00 service fee will be assessed to the orders. International orders- We'll be happy to accept your order if you call us directly. There is a $20.00 service fee for International orders and they will be delivered as soon as possible. Wyoming Florist is best known for providing high quality flowers at a value to our customers. We are also known for the quality of our sympathy designs.